Finally, your braces have been removed and your smile is beautiful, straight, and best of all, metal-free! However, your orthodontic journey isn't quite completed. To keep your smile looking its best, you'll have to wear an upper and lower retainer to preserve and stabilize your results. Retainers are needed to control or limit potential changes in tooth position. They are used after braces treatment to hold teeth in their correct alignment while the surrounding gums, bone, and muscle adjust to the new positioning of your teeth. Traditional removable retainers typically include a metal wire that surrounds the front teeth and is attached to an acrylic plate that rests on the roof of the mouth. 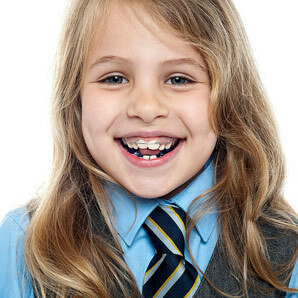 The metal wires can be adjusted to finish treatment and continue minor movement of the front teeth as needed. Typically, the lower removable retainer is a back-up to the lower fixed retainer and only needs to be worn if the lower fixed retainer breaks. The upper retainer should be worn only while sleeping unless the patient is directed to wear it more often. Aligner-style retainers, look similar to clear aligners and offer a more aesthetic alternative to wire retainers. This clear retainer will fit over the entire arch of your teeth. It, like the wire retainer, is produced from a mold of your newly aligned teeth. Fixed retainers consist of surgical grade, stainless steel chain bonded behind the bottom and/or top teeth. While the device is usually required at least until a patient is 25 years of age, when the adult muscular development has been completed, it is often kept in place for life. However, removable retainers can get lost easily, so remember to keep yours in the case whenever you remove it to eat or brush. A fixed retainer is great if you don't want to keep track of a removable one, or if you don't want to worry about how many hours per day it must be worn. Teeth with fixed retainers require a little extra attention to remove plaque while flossing. Patients with fixed retainers often must use floss threaders to pass dental floss through the small spaces between the retainer and the teeth. Hard foods can break fixed retainers, so we recommend chewing hard food on the back teeth.